That’s the scary clown of Wasco, California. Even if you like clowns, you have to admit they can easily become unsettling. Just a few little tweaks in the makeup, maybe drop the real smile for a painted-on smile, splatter a little blood, and what normally delights children becomes a monster straight out of Stephen King. If those clowns are skulking about in the dead of night while armed, then that makes them doubly terrifying, even if they’re just pictures on the Internet. 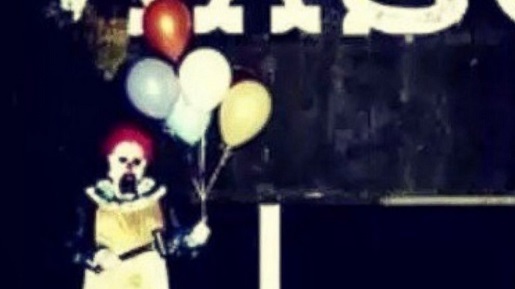 Mysterious clowns are terrorizing several small California towns, brandishing weapons and looking ominous. The clown, or clowns, have been spotted in Wasco, Bakersfield, and Delano, with photos popping up on Instagram of the clown at landmarks with taunting captions like, “Come out and play,” with them. Only one person, a juvenile, has been arrested as part of the prank. Otherwise, the clown or clowns are still out there, still active, and still terrifying everyone. Then again, some people like being scared by clowns, so perhaps there’s a market out there for this creeper’s services.